After serving in the army, Thomas Downing returned to the art scene when he began a teaching position in Prince Georges County, MD. 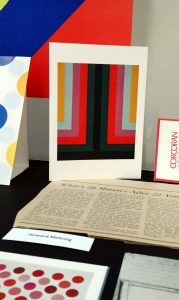 It was during this time that a student show at Catholic University inspired him to use his G.I. benefit to enroll in a summer art course. He was taught by Noland, whose target paintings would have a great influence on Downing’s own artistic work in that they represented the power of expression that could be achieved with pure color. 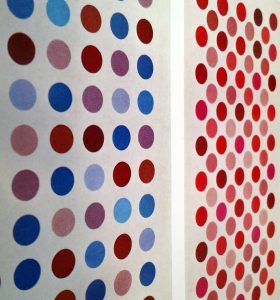 Downing’s characteristic dot paintings were created from an experimental period when the artist was looking for his own form. 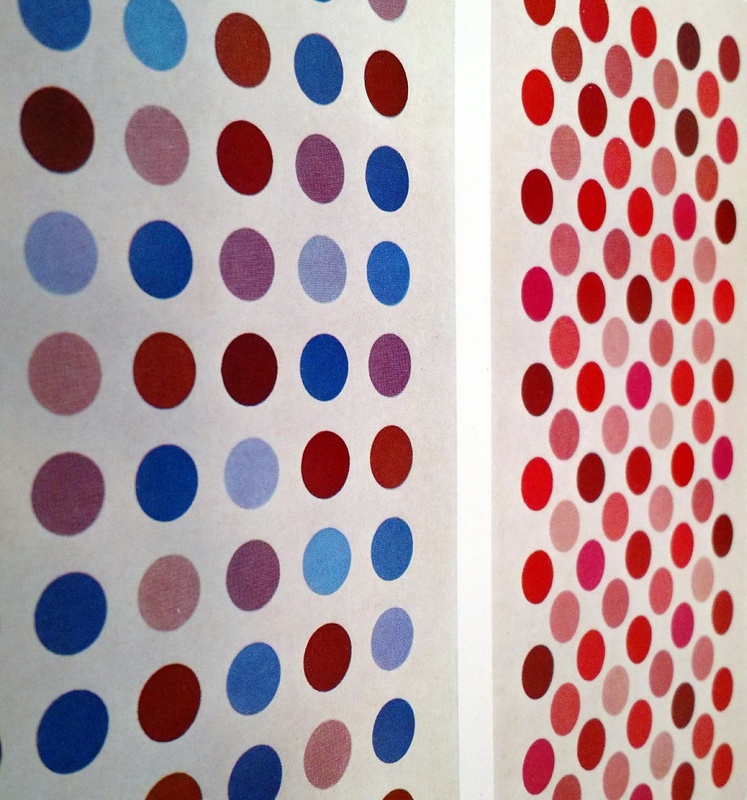 Two pieces in “Hard-edged, Bright Color” demonstrate Downing’s developments with the dot. 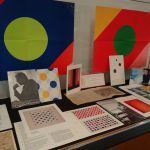 The first is an invitation to the 2002 exhibition Thomas Downing: Origin of the Dot, paintings from the Vincent Melzac Collection at Conner Contemporary Art in Washington, DC. The cover image is Downing’s Blue and Gold of 1963 in which the dots are arranged in a less structured floating design with a combination of vibrant and muted colors. 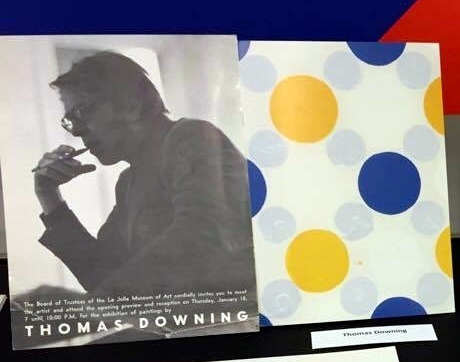 In contrast, the 1970 Thomas Downing Paintings catalogue from Pyramid Galleries contains the artist’s Grid thirteen and Grid six of 1970 where Downing has arranged the dots in a grid pattern of blunt colors. 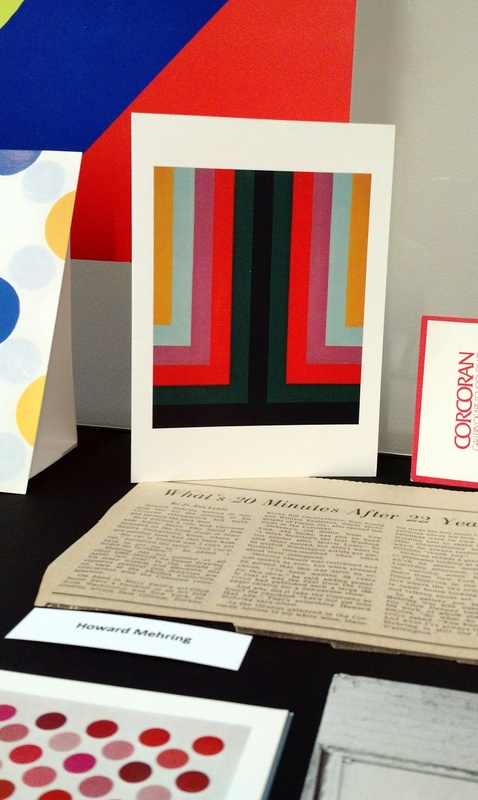 Howard Mehring was also taught by Kenneth Noland at Catholic University and from 1956-1958 he shared a studio with Thomas Downing. During the mid-1950s Mehring worked in a fashion similar to Jackson Pollock, on the floor, as he dripped and poured paint onto unsized canvas. By 1957, Mehring’s distancing himself from the hard-edged geometric paintings of what Clement Greenberg coined as “Post-painterly abstraction” and developed a distinctive style of sensuous, softer yet still vibrant paintings considered part of the “Lyrical abstraction” trend. However, by the early 1960s, Mehring returned to geometric patterns, this time imposing them over areas of textured color or experimenting with L-shaped compositions as can be seen in his oil painting Two and Three of 1966. 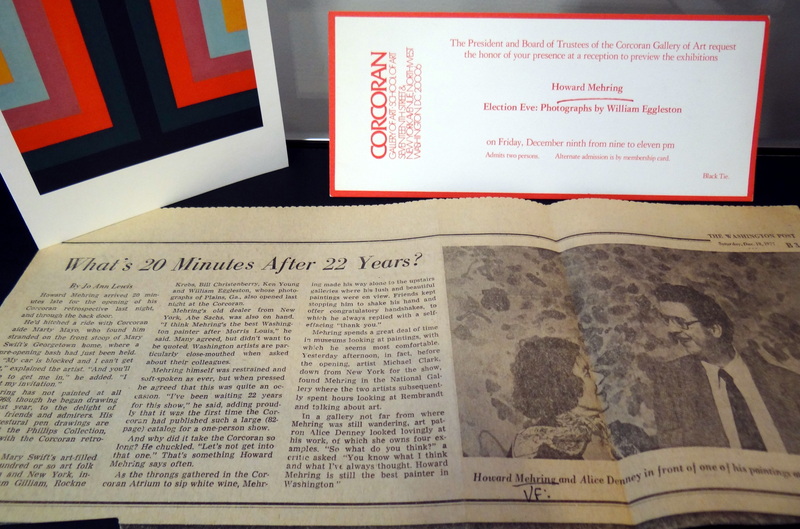 Around 1969, Mehring abruptly ceased painting for unknown reasons, working solely on drawings for the remainder of his life. He died of a heart attack in 1978 at the age of 47. 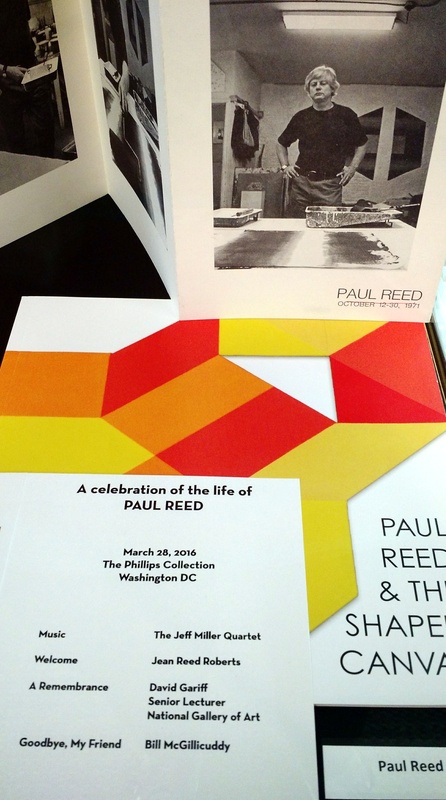 Two versions of Paul Reed posters behind colorful ephemera related to Reed, Thomas Downing, Howard Mehring and others. Already by 1965, a “second generation” of artists were working under the paradigm of the Washington Color School including Sam Gilliam, Willem de Looper, Ed McGowin, Alma Thomas and Hilda Thorpe. 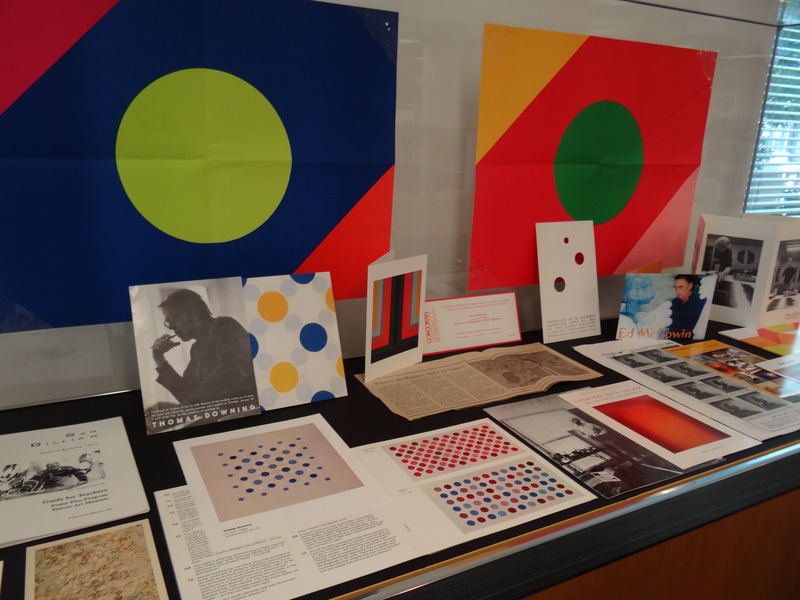 The exhibition “Hard-edged, Bright Color: The Washington Color School” at the American Art and Portrait Gallery (AA/PG) Library will remain on display until spring 2017.